A light dusting of snow this morning. My treacherous back has a habit of giving up on me every now and again, and did so in mid October, keeping me out of the moutains since. Once I was able to move again, I did get a few trips out at lower altitude (I didn’t want to risk it seizing up on a mountain), and I have a little bit of a backlog to get through now, as sitting at the computer for too long has also been a bit of a problem. I’m feeling ready again now to venture up on to the higher ground again I think. 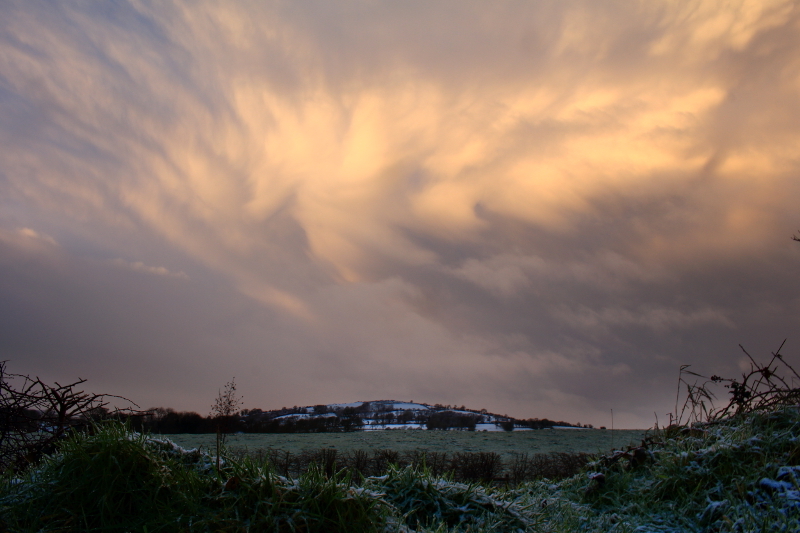 But, I was still pleased this morning to see a dusting of snow and an impressive sky just standing at my front door. There’s a lot of satisfaction in really having to make an effort to get an image, but its nice sometimes when they just fall in your lap. Posted in Landscape, Nature, PhotographyTagged Castlederg, Ireland, Muckle Hill, snow, Tyrone, WinterBookmark the permalink. Fantastic sky in that photo, Aidy. Hope the back is holding up well – I’m all too familiar with that kind of problem. Keep well, and keep the photos coming! Thanks John, appreciate your comment and good wishes. Very frustrating this last while, but itching to get back out, and ready now I think. Keeping moving is usually the best thing for it.